The William Wallace Statue was erected 1888 in Aberdeen, Scotland, and depicts Sir William Wallace. Sculpted by William Grant Stevenson, the statue is positioned opposite His Majesty's Theatre and across from Union Terrace Gardens. "It was paid for with funds left for the purpose by John Steill of 38 Grange Road in Edinburgh, the son of James Steill sometime of Easter Baldowrie in Angus." It is a category B listed building. The statue bears this inscription: I tell you a truth, liberty is the best of all things, my son, never live under any slavish bond. ^ "Wallace, William, Union Terrace and Rosemount Viaduct. LB20012". Historic Environment Scotland. Retrieved 6 March 2017. 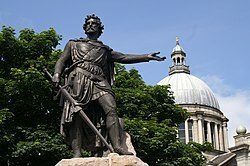 Gazetteer for Scotland: "William Wallace Statue"